But, then I started getting all of those SSKs and nasty tangles!!! 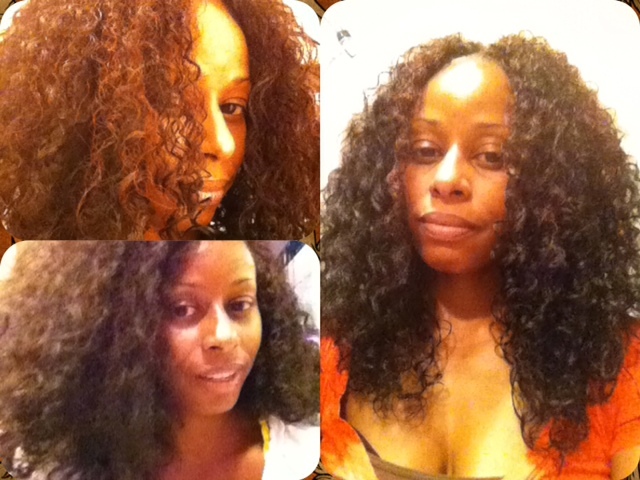 So, it evolved into a braid-out kind of summer. Anywho, realized that I haven’t posted an updated regimen and it’s changed since I last posted it for the GOC that started in April. I’ve chronicled everything here during regular weekly posts. But, figured I’d put it in consolidated form for those who are seeking a one-stop shop for it ;). Working in sections, pre-poo and finger detangle dry hair with Aubrey Honeysuckle Rose (moisturizing) or GPB conditioner (protein) mixed with Vatika Oil. I alternate the Aubrey conditioners depending on what my hair seems to need, but generally I’ve been using the GPB every 2-3 weeks. While detangling, conduct Search and Destroys (S&Ds) to eliminate any visible/tangible split ends and SSKs. Place hair in 6 twists. Oil scalp with Wild Growth Hair Oil (WGHO) original formula. Don plastic cap and apply heat using Hair Therapy Wrap for a minimum of 1 hour. (I’ll usually sleep in the pre-poo overnight out of laziness). 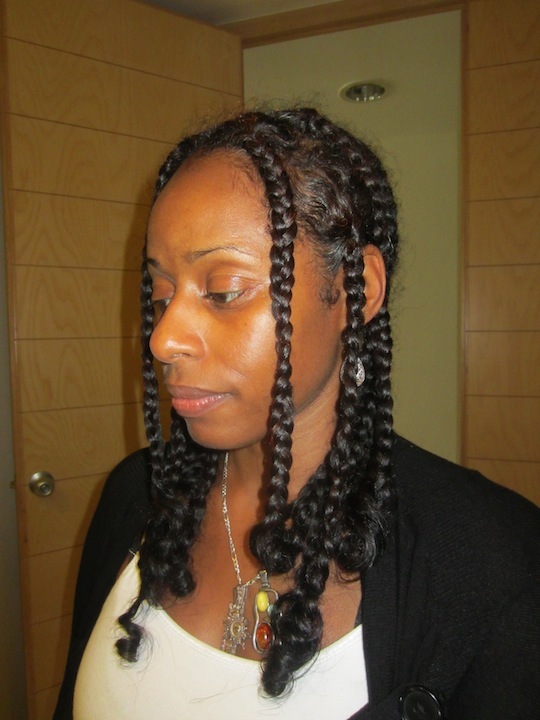 Shampoo hair in twists with DevaCare No Poo diluted in water (approx 2 oz. shampoo to 5-6 oz. water). If hair is especially tangled, condition and finger detangle further with Herbal Essences Hello Hydration (HE HH). Deep condition with Matrix Biolage Conditioning Balm (minimum 1 hour under Hair Therapy Wrap). Use “Cool and Seal” DC technique to rinse DC with diluted HE HH. WnG: Carol’s Daughter Healthy Hair Butter and LaBella Lots of Curls. Braid-Out: LI only or LI with Wonder Curl Butter Than Love Pudding. Seal with JBCO/EVOO mix or WGHO Light. Air dry and/or use hard bonnet dryer to speed drying time. Shine/Release braids with Wonder Curl Polishing Pomade, Moxie Hair Bling or WGHO Light. Wear hair out 3-4 days, maybe re-braiding once (little more manipulation and exposure than usual; So, I’ll probably go back to 1-2 days out and 5-6 days in a protective style come September). 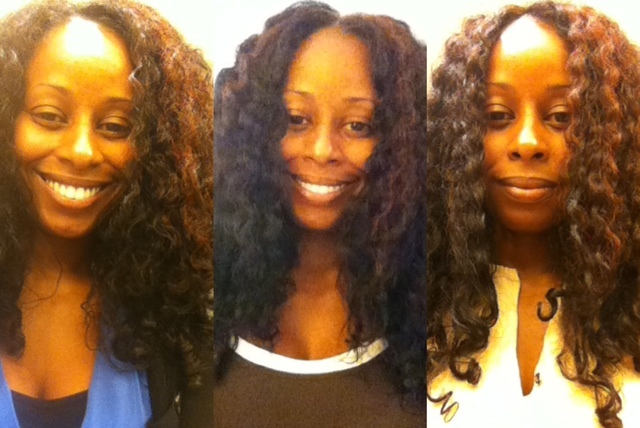 Protective/low manipulation style as needed once braid-out becomes too frizzy (buns, updos, side braid, etc.). Nightly: Pineapple, loosely braid or bun and don satin scarf /bonnet for bed; Sleep on satin pillowcase. Massage scalp with WGHO as needed, usually 1-2 times during the week. Deducting the time spent “marinating” with my pre-poo and DC, the actual work time for my wash day is probably about 3 hours: 1 hour pre-pooing/detangling and 2 hours to wash, condition and style. Since I don’t tend to do everything in one shot, but rather split it over two days, I tend to spend 1 hour on Friday or Saturday night for my pre-poo session and 3 hours on Saturday or Sunday to wash, DC and style. Two step henna/indigo (roots only full strength application/gloss on length). Clarify, with diluted Ion Curl Solutions Shampoo or Aubrey Green Tea Clarifying Shampoo. I still have the ApHogee 2 Step Protein Treatment under the sink and now I have a hard bonnet dryer too. But, for the immediate future, I have no plans to do another 2 Step Treatment. My hair has just been doing so well with the Aubrey GPB, I don’t feel it’s necessary right now. But, maybe I’ll revisit it in the fall or winter. Does your regimen change with the seasons? If so, what is/are the major difference(s)? Thanks for the update on your regimen! Shelli, I am just getting used to my hair,and slowly working my way into a regimen. I have been transitioning for 10 months,and have been following you religiously. Thanks for all the wonderful tips. You hipped me to Vatika Oil and Aubrey Organics. My hair is really responding to the Aubrey Organics GPB,and the Honeysuckle Rose in rotation as you suggested. Keep us informed,your suggestions are great!!! Awwwww, thanks for the feedback Francine! I’m glad that my suggestions are working out well for you!! I sure do love those Aubrey conditioners!! I just restocked with Vitacost and think I ordered the Rose Mosqueta conditioner to try it out too as I heard some good things about it. Dang shame that I don’t even remember what I ordered … and it was just yesterday!! Hi! I noticed that you use Carol’s Daughter healthy hair butter for wash n go’s. I actually have been using that to set my twists with great results, but I was hesitant to use it for WnGs on my fine hair. How has it worked for you? Hey Shelli, I have a question about CDHHB as well. When you used it earlier this year, I remembered that I had it under my sink. I used it and got pretty good ponytail action with it. I decided to reorder and now the consistency is more like a creamy styler than the thick butter that was under my sink. Did the consistency change or was the one that was under my sink under there too long? (P.S. I don’t like the creamy version as much, even of it is the same product). Hmmmm … Tracy, I think mine is pretty creamy … it’s thick, but it’s very smooth? I think when I got it in the early 2000s, it WAS thicker/heavier. But, it’s been this consistency for a couple of years now and works okay for me. Now, how long was it under your sink? Maybe some of the water evaporated from it and it got thicker? Of, could it be an older formula b/c it’s just that old;)? LOL!! This is going to be my first “curly girl” winter. I have no idea what I’m going to do! Take it one day at a time. Maybe you won’t need to change your regimen at all Pennie. I’ll just wear more updos during the fall/winter. But, I plan on keeping my products the same … unless something amazing comes along;). This is so helpful, Shelli! I had to revamp my regimen and include a detangling/prepoo session because at only one-month post BC I’m noticing SSK’s already and I’m paranoid. Previously, I had been detangling with condish in the shower with no problem. However, my curls/coils are really coming in now and detangling is a beast. I love the AO conditioners too; I mix HSR or GPB with AVJ and oil to detangle. Works like a charm! Awww, thanks Lavendar! I’m glad that you found it helpful!! I haven’t tried mixing AVJ into my pre-poo mix. Hmmmmm …. maybe I’ll give it a try one day:). I like seeing the different angles in one condensed shot! That pic of your braid out right after the pic of you in braids is bee-you-tee-ful!!! Tracy, I just wish I could get the full pics in the smaller pane!! I spent Sunday trying to find an app that I really like. So far, the two I’ve downloaded cut-off pics. But yeah, I like being able to put different angles of one style in one collage too!! So, I’ll keep looking for a program/app that enables me to combine the pics into a collage without losing parts of the pics! And thank you in regard to the braid-out!! I showed those pics before. 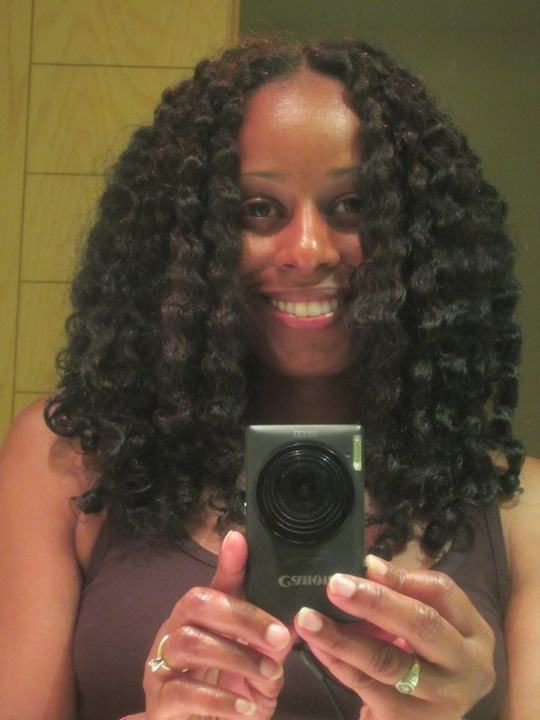 That was the braid-out from my vacation in Mexico! It’s what started me hard on the braid-out kick:)!! I LOVED the results too:)!! Haven’t re-created the exact look since:/. LOL!! But, that’s because those braids set a good 4 days and got wet in a pool, dried, got spritzed, dried. I think all of that contributed to a great set and if I only leave them in one day, the braid-out doesn’t turn out as nicely. Your hair looks great as always. I just wanted to know if you have suggestions. Being that I work full time and I am in school I have not been doing my usual treatment. I have been doing a quick was on the weekends. I put my leave in conditioner in. I roll my hair and pin it up. It actually has been looking pretty cute. After washingthis past sunday morning, my hair even looked as though it has grown alot.I guess I just want sugestions for quick easy styles, updos that are professional, yet sassy. Thanks Timber!! Awwww, thanks!! It sounds like you are doing wonderfully with your hair. In regard to hairstyles, if you check under the Style Library tab above and “Updo,” you can find pics and tutorials for quite a few hairstyles. The Style Inspiration category may also give you some ideas. HTH! Hello!! Really enjoy your posts!!! Thanks!! Wondering which Wonder Curl Butter Than LoveProduct you are using for your WNGs? I see there is a gel, pudding, and whipped? Hi Jackie, I dont’ use WC for WnGs. I use it for TnCs and braid-outs. I use the Wonder Curl BTL Pudding. 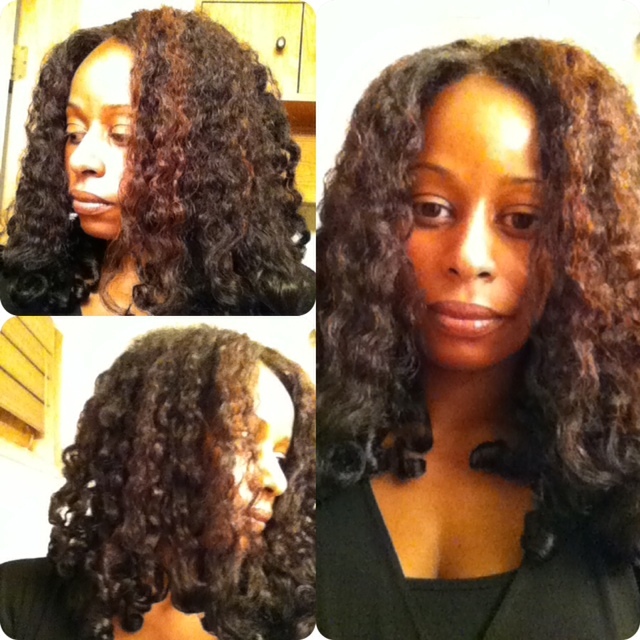 I have used the gel for a braid-out and Tameeka used the Jelly to do my WnG when I got my hair cut back in June. But, I haven’t used the Jelly to do a WnG myself.